In the winter after I learned how to make hammocks I decided to try and make a warm one. This hammock is fun fur lined with a thick fleece shell. It is 1.5m wide and 2.5m long. I actually built it to fit under the 3m long double wide nylon hammock that I started using as a tarp. This hammock is very comfortable, but does not actually block the wind very well, so it is not quite as warm as I hoped for winter sleep. However, it does make an extremely warm blanket on a double bed. 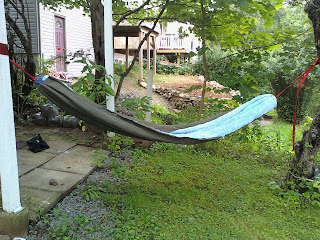 It has been well used for about a year, but has now fallen into disuse since I made the double wide fun fur windproof hammock. Not specifically this hammock, but proof that these hammocks are all going to be the best hammock.